NCVER hosts a range of events which aim to promote research and foster research community and stakeholder engagement. Join the discussion at one of our conferences, forums, webinars or workshops. 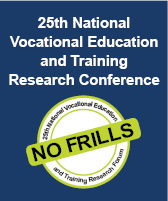 Since 1992, NCVER’s mid-year National Vocational Education and Training Research Conference has been bringing together diverse perspectives in relation to policy and practice from across the VET sector to share, discuss and present on priority issues. 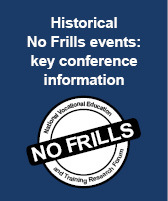 'No Frills' provides an opportunity for networking and ideas sharing in a friendly and informal atmosphere with a cross-section of industry representatives, practitioners, researchers and policy-makers. 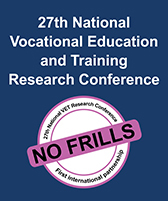 The conference also contributes to building capacity and capability in VET research by providing opportunities for engagement and learnings for early stage career researchers and more experienced researchers. The conference became colloquially known as 'No Frills' because no fees were charged for attending in its early years and participants had to be largely self-sufficient. Information on past conferences can be found below. 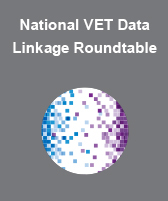 NCVER hosted a one-day National VET Data Linkage Roundtable in Canberra on 17 May 2018 with a group of data custodians, governments and researchers to discuss methods and opportunity for the implementation of a set of best practice principles in data linkage. The roundtable started with an opening address from Dr Michele Bruniges, Secretary, Australian Government Department of Education and Training who spoke about the importance of collaboration and the strong potential of data linkage to give multifaceted insights that will better inform policy decisions. 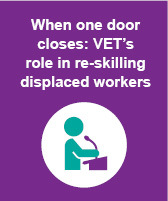 This was followed by case studies, expert presentations and open discussion aimed at encouraging further data linkage projects drawing on both VET and other statistical collections that would benefit the VET sector. View video and PowerPoint presentations via the link below. Research forums aim to present the latest research around particular topics or themes in vocational education and training. Information on past forums can be found below. To register your interest for future NCVER events, email events@ncver.edu.au.